The entire purpose of this article is to take over the discussion thread about fare collection on the Queen car which launched itself in the service analysis piece. Some operators will open all doors at most stops while others force everyone to board through the front door at most stops except for the subway interchanges. I’m curious as to what kind of effect this has on service. Steve: I’m sure it has some effect, but this is impossible to measure with available data as info on boarding patterns and times is not included. Also, all door loading has less of an effect at comparatively minor stops provided that the car is not packed and adding those “last few riders” doesn’t cause delays. Some operators will open all doors at most stops while others force everyone to board through the front door at most stops except for the subway interchanges. A passenger physically fought with a driver on a sleepy Tuesday afternoon last year about the driver not opening the back doors at Simcoe on the Queen car. The driver explained that he was just trying to fight fare evasion before a scuffle began between the driver and the passenger who had claimed that he had a transfer but refused to show it as he said that the driver had no authority to ask for the same on POP routes. The streetcar had to be taken out of service and the driver suffered minor injury requiring just two band-aids. The passenger ran away before the police arrived. All door boarding means all door boarding and not what the driver feels like boarding and fare evasion is to be fought through Fare Inspectors, Special Constables, and Toronto Police and is not the driver’s responsibility or jurisdiction on Proof-of-Payment (POP) routes which is exactly the idea behind POP. When did you last see GO Train drivers or VIVA drivers fighting with passengers over fare? In the case of that assault while I am not blaming the driver, the driver is not completely blameless. I am not sure if that customer who fled later got arrested as it was not in the news. You are bang on Joe. POP is POP period. 501 is my home route and Neville is my home stop. QUEEN 501 has NEVER been fully POP since 1995. If there has been a gap and a lot at Neville, maybe? the back door will open. Back doors in RH usually open, sometimes at Coxwell, then maybe Broadview and so on. OPs who are questioned nicely in the Beach always say their instructions are to do “as they please” regarding doors BUT they should enforce fares and inspect transfers. They ALWAYS question and look at transfers which is none of their business being a POP route. When you send a note to Brad Ross, he just says Queen is a POP so he is no help. So basically TTC says to public 501 is POP and to it’s own OPS, 501 is NOT POP. Obviously Church to Spadina is all-doors open and I have no experience in the west end. Steve: A big problem is that Queen really was never full-on POP the way it was implemented on Spadina, or even King, and there was always a sense that fare evasion was a bigger issue than customer convenience. The TTC didn’t expend the resources in fare inspection (and still doesn’t), and so it fell to operators to “use their discretion” about where to open all doors. The driver explained that he was just trying to fight fare evasion before a scuffle began between the driver and the passenger who had claimed that he had a transfer but refused to show it as he said that the driver had no authority to ask for the same on POP routes. The streetcar had to be taken out of service and the driver suffered minor injury requiring just two band-aids. The passenger ran away before the police arrived. … the driver is not completely blameless. I’m sorry, Joe, I do not understand. How is the driver is not completely blameless? Did he provoke the assailant, and if he did, how? Would it have been better to let the man illegally board the car, then call the police to arrest him a few stops further? I believe that Canadian law states that “first punch” is the violation, and responding punches are “self-defense”. In that case, the streetcar driver was innocent. The driver was assaulted. That he needed “just two band-aids” is irrelevant. Also, regardless of him being 100% in the right, people who believe the driver shares blame for getting punched in this situation are just assholes. The driver was doing his job, and “boxer” isn’t in the TTC job description. Steve: The TTC’s web page is out of sync with how they claim to be operating on Spadina, Harbourfront and King. Queen is an obvious extension of this if only for consistency. There is a big problem with confusion and annoyance when people approach the streetcar expecting all door loading (inevitable on the Flexities anyhow), and don’t get it. Much worse, get chewed out by the operator for getting on at the back door. Because the driver tried to physically block the passenger’s way while he tried to walk down the aisle. Another reason why the driver was not completely blameless for his own assault. And most importantly, it is a POP route and a POP route is a POP route whether someone enters through the front door or the back door and if a driver will not walk to the back of the streetcar to check fares of people entering through the back doors, why should he/she discriminate against those entering from the front door? If I were a defense lawyer for the customer who assaulted the driver, then I would pounce on these issues. I am highly sympathetic to the driver but just saying that he should not have overreached his authority and trying to do the job of a fare enforcement officer, special constable, or a police officer and the driver doing so also delays other passengers to prevent which is exactly the point of the POP. If the drivers want the customers to respect TTC’s policy of requiring customers to pay, then perhaps the drivers themselves should respect TTC’s policies including that of all door boarding on POP routes rather than avoiding opening back doors unless opened by an exiting passenger. Also the new streetcars don’t collect fares (unless you have a Presto Card which not everyone has nor is everyone required to have one) and so these streetcars on Bathurst are effectively free as there are no fare machines on Bathurst. Even on Spadina, streetcars are effectively free as not every stop has a fare machine and so the passenger can always claim to have boarded at one of those stops and if it’s an old car, then he/she can show (if fare checked) an untapped Presto Card as intention to pay and if it’s a new one, then he/she can show a token or three dollar in change as intention to pay. I agree 100% with Joe; namely, when was the last time you saw GO Train drivers or VIVA drivers fighting with passengers over fare? (Hint: NEVER) Yet in the last few weeks alone, I have been delayed thrice on Queen during day time. During one of those disputes, I actually paid an extra token since the driver refused to budge and refused to move the streetcar unless the homeless guy paid the fare and I had to get somewhere urgent and of course unlike buses when a streetcar driver refuses to move, all the other ones get stuck behind as well and so there was no point getting off and waiting for the next one. The homeless guy had entered through the front door as the operator refused to open the back doors and the homeless guy said that he had a transfer and would only show to a fare enforcement officer or police officer as it was unfair that the driver was checking his fare just because he was homeless when so many other people had entered through the back doors at earlier stops and for whom said the homeless man, the driver never checked the fare. This is so true that the homeless suffer a lot of discrimination in our society (I see them kicked out of malls, restaurants, etc even when they buy something and sometimes I try to fight for them when I see the injustice and NOT a single person has ever supported me as everyone else is just an “innocent” bystander (notice the sarcastic quotes around ‘innocent’)). I tried to give the homeless man two tokens that I had left as well as five dollars but he refused to accept and so I think that he was actually telling the truth about having a transfer and the driver unnecessarily delayed everyone. During another two of those disputes, I got fed up and decided to walk and there were many streetcars lined up behind each other in both of those cases. And so what if a homeless man or a homeless woman got on without a fare? The homeless guy’s clothes were all torn and shoes broken and the driver had ZERO heart and keep in mind that the homeless guy refused to accept two tokens and five dollars that I offered him. Wake up people, have a heart – help the homeless, the disabled, the elderly, and the children. I can’t wait for the new streetcars to take over for as long as the old streetcars are still there, some macho drivers will continue to take the law in their own hands and delay everyone even though it is a POP route and none of their business or authority. I believe that the concept of Proof of Payment – is that you are required to produce proof of payment to an authorized representative of the operator (TTC) when asked to do so. I would put to you that the driver is being asked to check – therefore is authorized – and merely asked the person in question to produce the requisite proof. It sounds more like the person in question refused the inspection. While the TTC does not have a specific fare inspector on board, what in TTC policy, or TTC direction should be taken that the driver – or any other TTC employee may not at times act to verify proof of payment. It may not be what everybody understands – but why should not the driver act periodically as inspector, when time permits? If you have a valid transfer, pass, validated TTC ticket or POP receipt, you can board at any streetcar stop on Queen Street, The Queensway, or Lake Shore Boulevard using the centre or rear doors from 7 a.m. to 7 p.m., seven-days-a-week. At less busy stops, the driver may open the front doors only, depending on the number of customers boarding. When boarding at the front doors you must pay a fare or show a valid transfer, POP receipt or Pass. Remember – if you are connecting to a surface route from the subway, you must take a transfer where you pay your fare. During busy periods, drivers will open all doors to allow customers to board. As a courtesy, remember to let passengers exit from the car before trying to board. POP is in effect from Long Branch Loop to Neville Park Loop. Note from the first sentence that all-door boarding is only 7:00-19:00, which I infer by observation that some customers are not aware of. The second sentence only makes sense as an exception to/limitation of the first, so ultimately it’s the driver’s discretion to open the centre/rear doors for boarding or not. And if the driver does not, the customer is required to show the driver PoP or pay a fare. Based on the above, it sounds like the driver was entirely correct, and the person who assaulted him/her was wrong in policy even ignoring being wrong in moral terms. Steve: I would say that the TTC’s site is a bit behind the times in tat it does not include 511 Bathurst, and its description of operations on Queen don’t match what is actually (in theory anyhow) in practice on King and Spadina. What we have is a fairly typical TTC left hand, right hand situation where there are conflicting instructions and “official” policies. I don’t think that quoting a policy that is clearly out of date is the best way to win an argument one way or the other. Just wanted to reiterate that this is happening. Even with the discretion the policy allows, passengers are clearly allowed to board through rear doors on the POP routes, yet I pretty regularly see operators literally yelling at passengers for doing so on King and Spadina. Frankly people need to start taking badge numbers for this stuff; the complaint process isn’t great, but it might just be the sort of thing to get Byford’s attention if there were a spike in something so directly customer service related. And this is also the answer to the earlier, unbelievable, discussion about how a particular driver might be partially to blame for their being assaulted. Claiming the driver is to blame for being assaulted is, in general, just victim-blaming (I will parenthetically remark that there are of course possible actions by a driver that could constitute provocation or even an assault of their own, leading to a mitigated assault or even self-defense by the customer, but I didn’t see any such allegation). Simply enforcing a rule, even if incorrectly, does not justify the customer assaulting the driver; furthermore, in a peaceful society this point is not up for discussion. I think the question however would remain – is it unreasonable for an operator who suspects failure to pay to inspect the fare? It should be done in a respectful manner – but fare inspection is reasonably part of the process no (with the exception of a strictly subway trip)? Steve: Can we end this discussion here? The original point was not just what an operator’s job or TTC policy might be, but whether this is practiced differently depending on the type of person being challenged (if at all). There is no question that operators are part of the fare inspection regime, and that invalid or dubious “fares” should be challenged. If there is bias in how this is done, that’s a separate issue, and the TTC, just as with all public agencies, needs to be alert to such problems in its “customer service”. Assault of operators by riders is a real problem, and it occurs for many reasons. I think that in a thread about service quality, we have wandered a long way from the original topic. Enough. Either you haven’t actually ridden one of the new cars, or you haven’t looked around much inside. Every new streetcar has two fare machines, one by each of the middle two doors. They take cash or a token, and emit a fare receipt, good both as proof of payment and as a transfer. So, no, the new streetcars aren’t free if you don’t have a Presto card. And unlike some of the posters here, most people are honest enough that they want to pay the fare. 511 isn’t POP. Customer service is clear on this. Yes there’s some LFLRVs running for a couple of weeks during the games. Presumably they aren’t concerned about lost revenue from scofflaws for this short period of time. I can’t imagine how anyone is claiming that the driver can’t ask to inspect a fare on a POP route. They are authorized to do this. In addition, the website clearly says that those boarding at the front door on Queen must show pay a fare, or show a transfer/pass. Though inconsistent back-door opening is a problem. What’s a “less busy stop”? What is “number of passengers boarding”. The old graphic that TTC used for years clearly showed one person boarding in the front, and another boarding in the rear. I wouldn’t physically confront a driver, and I always show my pass when entering the front, but if I’ve been standing at the rear door, and there’s been 2-3 people entering the front door, and especially people exiting the front door, I’m going to say something, and based on his response file a complaint. Sometimes the response is “oops, sorry” … and then I’ve noticed they are very good about it. Once it was “but I did” … and he realised there was a mechanical issue, and proceeded to test the doors, and noticed they wouldn’t open. If there’s only 1 or 2 people, I head to the front doors – not a big deal. Presumably this issue will vanish as we move more and more to 24-hour POP on all routes. I’m not sure how anyone can be so grossly misinformed to think that if the streetcar doesn’t have a Presto machine, it’s a free ride. I can only assume they are fishing. Guys, all agreed, but my issue is 1) consistency and 2) call it what it really is. NOBODY but nobody should ever have to read website rules (like reading the fine print) I go to another city? I drop coins in and want to go, not pre-read the website rules etc. (Transit fans read everything but nobody else does, geez, most people do not even read destination signs.) So, if 501 is driver discretion, DON’T call it POP period. Those advert stickers have been on there since 1995 (7-7 POP) They do not specify “only busy stops”, “driver discretion” etc, they say 7-7 POP. To be consistent, get rid of the silly POP signs UNTIL 501 is POP. (You can still open all doors at discretion but quit puffing the TTC chest out claiming POP) Too much to ask? Nicely said there Bill. POP means POP and does not allow for overzealous drivers to opt out at will. I would not physically confront anyone either but I have been taking the TTC since the 1960s and have seen drivers use force many times for absolutely no valid reason and if a driver does that, then the customer has 100% right to self defense regardless of whether or not he or she paid a fare since we live in Canada and the punishment for fare evasion is definitely NOT getting assaulted by a driver. … the new streetcars aren’t free if you don’t have a Presto card. You may be right in theory but in practice it’s far too cheaper to pay fines than to pay fares and even for fines, just fight it on court and almost certainly the officer will fail to show up in court in which case the fine is removed by court BUT YOU HAVE TO FIGHT THE TICKET AND DECLARE YOUR INTENTION TO DO SO IN TIME AND ALSO YOU HAVE TO SHOW UP TO COURT ON TIME. I am NOT encouraging anyone to travel without fare but just pointing out how flawed the system is and no wonder the TTC is bleeding money. I never realized that the pop system caused so much consternation. Then again, I don’t think I’ve ever used it–force of habit to board at the front. Is it not worth it to install a farebox on the back stairs and have a collector ride at the back during pop hours, since people are unhappy with driver discretion? At least until the pop routes are fully covered by the new streetcars and people will be judged by machines. Steve: That’s a lot of rear door conductors. Such staff can be better used as loaders at major stops than on board cars where they would just get in the way. This illustrates once again the problems that having a fare on a transit system creates. Of course the TTC could do better in terms of policies, but fundamentally if it was funded properly out of general revenues (like roads are) none of these situations would occur. Operators could concentrate on operating their vehicles, passengers would not have to understand nonsensical rules, that may or may not have been communicated properly to staff. Passengers would not have to go buy tokens, pass or put money on a Presto card. We could all just get on with our lives. I experience problems in Ottawa. If I pay using Presto I can board by the back doors of the articulated buses and double deckers. However most passengers in Ottawa are still using paper pass or are post-secondary students (the last institution will switch over to U-Pass the integrated student pass/ID). So it’s a fight at rush hour to have access to the Presto reader (passengers block the reader) and it slows down boardings. Schedules have had to be adjusted. Ironically in September I will once again need a monthly pass, so I will buy a paper pass and avoid this nonsense. I can keep my pass in my pocket until asked by a fare inspector to show it. Presto has not brought any operational efficiencies, has increased fare collection costs (in Ottawa at least), so why do we persist with it? I can foresee problems in the Flexities once Presto is widespread in Toronto. Steve: I too expect problems with Presto, but like UPX, it is a provincial program which “must” work because the minister said so, and the best we can accuse a minister of is being “badly advised”. I really wonder how many people in Metrolinx and in the TTC for that matter really understand the day-to-day dynamics of how people move around on transit vehicles. Certainly, most of the politicians who are asked to rubber stamp new policies haven’t got a clue. If Presto is deployed in Ottawa, why not eliminate paper passes. TTC has already announced that paper (well plastic) passes, tickets, and tokens are not expected to last 6 months past full Presto deployment. Why spend the extra money to print and distribute passes? It will be important to keep track of Presto capabilities and implementations in other cities to avoid being railroaded into “the computer can’t do that” load of BS from people who may be pushing a preferred fare scheme for the GTHA. It seems to me that several of the respondents in this thread are conflating two connected but very different concepts: Proof of Payment and All Door Boarding. All Door Boarding means that I am permitted to board at any door. Obviously this cannot be allowed as a general rule except on a PoP line; however, it is sometimes permitted on a very busy line at rush hour, either to speed loading, or to allow people to get on at the back where there is more space. A Proof of Payment line requires all riders to be able to show that they paid, whether All Door Boarding is allowed at every stop, or only at busy ones. All Door Boarding is really only possible on the new low-floor streetcars. On the outside doors, they have a red button, which a patron should press to open the door for themselves. The blue button is to notify the driver the patron needs the ramp, which the driver will deploy. Unless they add the buttons to the refurbished streetcars, the driver of the old streetcars has to manually open the rear doors. Unless an inside passenger opens the rear door to exit the any streetcars, of course. Of course to open the rear doors on the old streetcars, the inside passengers has to step down on the step. On the new streetcars, the inside passengers has to press the red button to open the doors (and the blue button to notify the driver that they need a ramp deployed). I always take a transfer, even if I will not be transferring. Makes a good bookmark. Steve: I’m really not sure of the distinction you are making. One way or the other, the operator opens the doors, or at least enables the pushbuttons (LFLRVs) or treadle steps (C/ALRVs, exit only). If the policy is to open all of the doors all of the time, then it does not matter which type of car. All door loading is in effect on many streetcar routes already. Drivers typically open all the doors. Some though only open the front door if there’s only 1 or 2 riders – and that’s where things get complicated. My friend already figured out a way to beat Presto and so he can’t wait to have Presto fully implemented. As for me, I am a son of a millionaire and so I don’t mind paying the fare. Steve: The same problem applies to Conservative and NDP Ministers. It’s not the party, it’s the question of preserving the image of infallibility for whoever is in power. It seems the TTC is one of the parties conflating the two concepts. Have you read the POP page on the TTC web site? However, if I board a CLRV on the 509 line and drop a token in the fare box, I need to take a transfer every time because I may be required to show an official that I have paid. What is the point of having fare paid loops for the 509/510(e.g. Union, Spadina sometimes Exhibition) if you need a transfer to board? When all routes go POP, Main Street, Bathurst, St. Clair, Broadview and Dundas West will face the same existential problem. Are they going to start printing transfers at the ex loop during the CNE? I’ve gotten on the Flexitys at union once or twice (and Spadina) and forgotten to take a transfer with me. Thankfully there were no inspectors. One time I forget the transfer and stood in the 510 line until a CLRV came because I didn’t want to lose my spot. Steve: The TTC hopes to have the entire streetcar system changed over by the end of 2015, although I don’t entirely believe them. This will put Presto readers on all vehicles, but it won’t eliminate the need for transfers or some form of fare receipt both for the roving inspectors and for actual transfers to other lines, notably the bus network which will be a year behind the streetcars. Stir into this a migration to some new fare scheme, and you have a recipe for confusion for at least the next 18 months. Was not the idea of Presto, to be able to sell it beyond just Ontario? If so it should be trying hard to ensure that it can support any reasonable fare scheme. Frankly if it can be tracked based on a rules bound system – then the computer should be able to do that. How do people figure out the fare – if you can do it now – then well, the computer should be able to do it. Steve: The original implementation of Presto was mired in technology and an operating model at least a decade old that, frankly, couldn’t be sold to anyone. It took the “Next Generation” version with many more bells and whistles to bring Presto into the modern era, a move that they did not want to make originally while trying to squeeze the most out of the original technology investment. As proprietary cards wane in importance (replaced by registered credit/debit cards and Smartphone apps), the real business “opportunity” is in the back end system that would convert those millions of “taps” into billing data. This is such a misguided approach. It is the tail wagging the dog. If it does not make sense to develop a competitive system – then you should be looking at buying in the best alternative. The notion that it is best because we invented it here – is destructive and costly, and the province needs to focus on best practice from anywhere – for this and all other parts of transit. When all routes go POP, Main Street, Bathurst, St. Clair, Broadview and Dundas West will face the same existential problem. Are they going to start printing transfers at the ex loop during the CNE? …. I’ve gotten on the Flexitys at union once or twice (and Spadina) and forgotten to take a transfer with me. Thankfully there were no inspectors. One time I forget the transfer and stood in the 510 line until a CLRV came because I didn’t want to lose my spot. 504 is already POP in the daytime from Dundas West to Broadview. I’ve been inspected several time on CLRVs on 504. The CLRVs are POP on 510 as well as the Flexities. I’ve had my 510 fare inspected on a CLRV. I strongly urge TTC users to insist on that. In my previous comment I wrote I would get a paper card and the reason is that even with a monthly pass of the correct fare class, I would still need to tap in each time I board a bus if I use my Presto card. It’s all about the policies that the transit operator wants. At first I thought it was to generate “data” in lieu of a proper origin-destination survey. But when you mentioned that eventually we might have to use our debit/credit cards or smartphones, I am beginning to see why that data would be useful to the private sector in terms of marketing. Presto is not about the technology, but using technology as an excuse to do things users would rather not do. That’s why I am so disappointed about the whole thing. I have not heard about any phasing out of paper cards and tickets here in Ottawa, am sure it will happen eventually. While the tickets cost more than a Presto fare, the monthly passes are the same price regardless of media. I too expect problems with Presto, but like UPX, it is a provincial program which “must” work because the minister said so, and the best we can accuse a minister of is being “badly advised”. I really wonder how many people in Metrolinx and in the TTC for that matter really understand the day-to-day dynamics of how people move around on transit vehicles. Certainly, most of the politicians who are asked to rubber stamp new policies haven’t got a clue. I totally agree with you Steve. We had an agreement in Ottawa that we would get the gas tax money without having to adopt Presto. Our new mayor having been a cabinet minister in a previous life, snatched defeat out of the jaws of victory and a new agreement was signed which forced us into Presto. But like you say it “must” work and everyone “must” use it. It would be have been embarrassing for the Province had a city like Ottawa not be required to use Presto. I can only imagine that the city of Toronto would have said no. @nfitz about whether or not new streetcars on route 511 are free: I’m not sure how anyone can be so grossly misinformed to think that if the streetcar doesn’t have a Presto machine, it’s a free ride. Since 511 isn’t POP, no one has the authority to demand proof of payment. You answered your own question when you said, “511 isn’t POP.” Since 511 isn’t POP, no one has the authority to demand proof of payment. I wasn’t particularly referring to 511. The original poster referred both to Bathurst, and also to stops on Spadina where there is no vending machine, and to simply boarding an old car, and claiming that the “untapped Presto Card as intention to pay”. As far as I know, TTC staff always have the power to ask for proof of payment. If an inspector is on a vehicle, and sees someone board the rear door, then they can ask for a transfer or pass. (Presumably if they had Presto on a new vehicle, they’d have seen them tap on). No, you can’t go up the entire vehicle checking everyone’s POP on Bathurst – but nothing stopping them standing inside, and asking those who just boarded! Can we stop haggling about who has the authority to do this? 504 is already POP in the daytime from Dundas West to Broadview. I’ve been inspected several time on CLRVs on 504. The CLRVs are POP on 510 as well as the Flexities. I’ve had my 510 fare inspected on a CLRV. 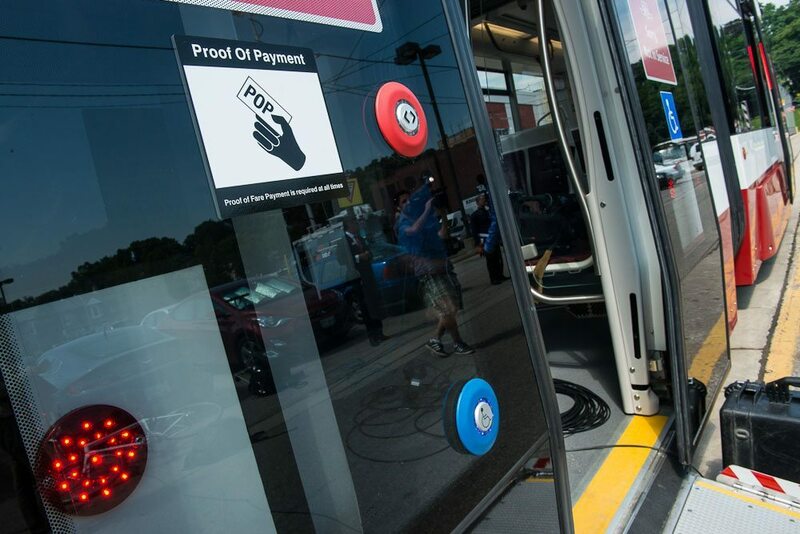 Why should a rapid transit system adopt the honor system for payment? Does it make boarding on the street faster? In theory, yes. According to testimony given above, no. Is there any disadvantage to it? Yes, someone who is so wrapped up in the spirit of inter-connectivity that the one-fare TTC network is designed for can forget a transfer to board a route which boards within the station (and in Union’s case, maybe 100 feet from the platform) and be under scrutiny for fare evasion. Can we think of any other reason POP is worth it? I’d rather have someone check my fare when I board, than harass me midroute. Would you rather someone check your movie ticket before you go inside, or midway through the film? Yes, they do this on railways, but those are also comfy rides, with leg room, time to relax and walk around. The 510 is no such rolling palace. It is a bare-bone means to get from King to Bloor in a marginally acceptable amount of time, which is fine by me, but the TTC (or whoever’s pulling their strings on this presto business) should remember that. Also do we have any idea how many transfers (i.e. your POP) have been lost, by children especially, in the history of transit ridership? It’s one thing to argue about a transfer while trying to get on a bus, another altogether if they pinch you without one on the bus. Steve: The TTC built fare-paid loops for the obvious purpose of avoiding the hassles of fare inspection/collection at major transfer points. They are extremely proud that visitors come to Toronto, sometimes from other galaxies, to marvel at this design. And then some bozo gets the idea they would like to keep track of passengers for “planning” citing cases of other systems that do this while forgetting that they were designed for a completely different fare structure. Not sure the relevance of children losing TTC transfers. Transit for those under 13 is free – so they don’t need transfers. 13-year olds should be able to figure it out – I started commuting to school at age 13, and I don’t ever recall losing a transfer. Pinch you? I watch them doing this. I’ve only ever seen them issue warnings – and very politely. During the transition, they seem to be quite reasonable. By the end of the year, all streetcars will be POP all the time; people will figure it out. In a couple more years, there won’t be any tokens, tickets, etc. That should simplify things. in practice it’s far too cheaper to pay fines than to pay fares and even for fines, just fight it on court and almost certainly the officer will fail to show up in court in which case the fine is removed by court BUT YOU HAVE TO FIGHT THE TICKET AND DECLARE YOUR INTENTION TO DO SO IN TIME AND ALSO YOU HAVE TO SHOW UP TO COURT ON TIME. Sam is absolutely right. I allegedly got caught seven times (it only counts when one is allegedly caught as everything else is simply a baseless allegation unless otherwise proven in a court of law) but all of the seven tickets were removed by the court. The seven tickets were simply baseless which is why the officers would not even bother coming to court as they knew that they would only be wasting their time as the tickets were completely baseless allegations of fare evasion which NEVER happened. I had totally forgotten about that. Pinch you? I watch them doing this. I’ve only ever seen them issue warnings – and very politely. During the transition, they seem to be quite reasonable. Perhaps I misjudge them because I don’t agree with what they do in principle, or because of other anecdotes heard of bus drivers dealing with fare evasion. Never had any bad dealings with a TTC driver over a fare personally. Will the mindset change after the transition period? By the end of the year, all streetcars will be POP all the time; people will figure it out. In a couple more years, there won’t be any tokens, tickets, etc. That should simplify things. What’s simpler than a token? And putting it in a farebox at the beginning of your trip? I get that you might need a more complicated system to handle on-street demand on busy routes. So if POP is really improving streetcar performance, I’ll leave it be. Baseless? Then why were you charged in the first place? It certainly sounds like there may be more to the story as it is hard to imagine that you would be charged seven times and that the officers would never show up in court.. Although, I am surprised you have not consulted a lawyer, because this sounds like you may have a case for wrongful prosecution or harassment if this is the case. 1) First, No TTC employee other than Special Constables have the authority to force anyone to produce any ID and so you don’t have to comply with the Fare Enforcement officers’ requests to produce ID nor do you have to answer any of their questions (just don’t try to leave as you might be manhandled and arrested). 2) Secondly, everyone in Ontario is entitled to receive all government services in English or in French and this includes things like receiving tickets (now, the law does not say that in order to receive services in French, one must not know English nor does it say that in order to receive services in French, one must actually understand French and so even if you know English and you don’t know French, just ask the fare enforcement officer or special constable or police officer or any TTC staff to give you instructions in French (you can make the request in English) and if they fail to do so, then any enforcement action taken against you can be successfully challenged (this includes removal of all tickets you have been convicted of for which your request to receive services in French were not respected)). I actually beat an ALLEGED TTC fare evasion ticket based on this (‘ALLEGED’ is the keyword here). Could you cite documentation, e.g. court records, for your alleged evasion of an `ALLEGED TTC fare evasion ticket’? I find it hard to believe that what you describe actually took place. As I understand it (and so far as I can make out from a quick review of some references), the provisions of the Ontario French Language Services Act do not automatically apply to a municipal agency that is not wholly funded by Queen’s Park, such as the TTC; and that is even assuming that the TTC is legally a municipal agency, given its arm’s-length separate-corporation status. If the TTC really is covered by the Act, they have much more to fix up than fare-evasion ticketing: signs, announcements, publications (at least in their most-easily-accessed forms) are all unilingual. Were the TTC mandated by law to offer all services in both official languages, I find it hard to believe that would have persisted for the nearly 25 years since the Act came into force in November 1989. In addition to what you said, if it really is true that a unilingual anglophone can insist on service in French (and vice-versa, presumably), then that is a profoundly ridiculous way for things to operate. The requirement for service to be available bilingually has a purpose, and shouldn’t be an excuse for scofflaws to avoid enforcement; only somebody who actually genuinely prefers to be served in French has any business avoiding a ticket because it cannot be given in French. But who knows, if it is true it wouldn’t be the most ridiculous provision in law. I think that Transit Enforcement officers and special constables should be replaced by armed Toronto Police as I am a BIG ANGRY LOOKING guy and I am yet to get a ticket but I see smaller people getting caught and ticketed all the time. New streetcars are free most of the time as just stand near a presto card reader or fare machine and only pay if you see an officer (usually only at subway stations). I am not saying that I am doing this but all my savings are going to help the homeless whom I encourage all people to help. I’m a regular blood donor. When I donate, I am offered a choice of parking validation or a pair of TTC tokens. How will the latter work once the TTC is entirely Presto-ised? Steve: Some of us are unable to donate blood due to age or medical conditions, and so this option is not available to all. It would, however, raise the question of whether Andy Byford should sport fangs and a long, black cape. With regard to drivers using their own initiative to enforce fare inspection on Proof of Payment routes — to what extent is this a driver education problem. I’m 58 now. In 1972, when I was sixteen and first put my TTC student card into heavy use it had curious restrictions. It wasn’t valid for the first hour or two of the day, and was only valid until 4:30 or 5:00 pm. Additionally, students who had turned 18 had to use an adult fare. In late 1972 or early 1973 the TTC liberalized the policy on student cards. First, they were valid 24×7 — not just schooldays; second, students could continue using them after they turned 18. Fast forward to 1974-75, when I have turned 18, and find many drivers refusing to honor my student card, because they KNEW it was only valid for students under 18 — a policy that had been revised more than a year and a half earlier. I changed the order of the cards in my wallet, so my birth certificate did not face my student card, but there were several drivers who remembered previous disputes who would always make me pay a double fare. So, is it possible overly aggressive 501 drivers simply aren’t paying attention during official driver update sessions?